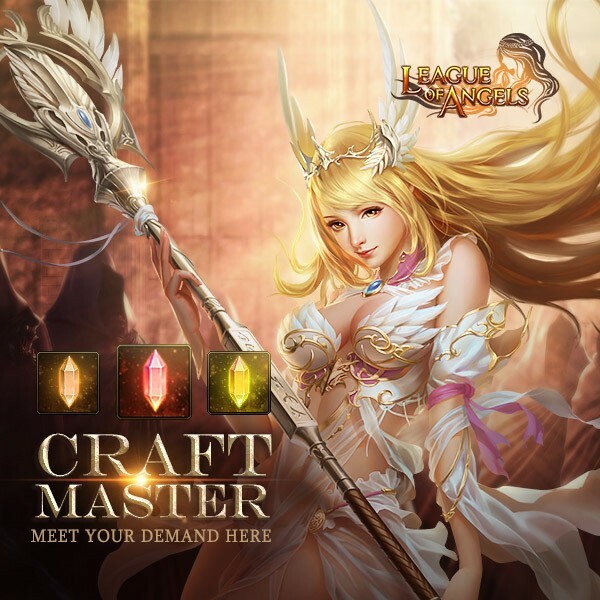 North America Forum»Forum ›League of Angels ›News and Announceme... › Enjoy Craft Master! There are three scenes for player to choose to start archaeological expedition, namely, Grand Library, Dusk Prison and Cloud Palace. For each scene, player will get different fixed output and random output. The fixed outputs are Epic Origin Crystal( Grand Library) , Legendary Origin Crystal (Dusk Prison) and Mythic Origin Crystal(Cloud Palace). The random output may include above origin crystals and Philosopher\'s Stones. - Philosopher\'s Stone will disappear when the event ends. 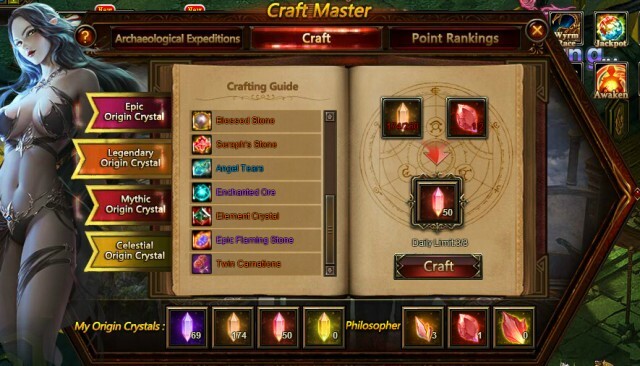 [color[color[color[colorAfter collecting specified materials, you can craft certain items, including Carnation, Twin Carnation, Cupid Wings Shard, Carnation, Twin Carnation, Carnation Bouquet, Awakening Stone, lvl. 10 Superior Gem Chest, Lvl. 9 Fusion Gem, Lvl. 10 Cherubstone, Lvl. 11 MATK+DODGE Gem, Lvl. 11 PATK+Crit Gem, Lvl. 12 HP+Endurance Gem, Lvl. 12 Hit+Dodge Gem, Skill Book-Odin\' Grace, Skill Book-Sand of Time, Ungodly Soul and many more. At the end of the event, the top 20 players with at least 3500 overall points have a chance to win Perfect Philosopher\'s Stone, Celestial Origin Crystal and Mythic Origin Crystal. why Philosopher\'s Stone will disappear when the event ends ? that`s mean i lost my stones from last craft ? Becouse they want you to spend money everytime? We recieved an ingame message stones would NOT dissappear after the event ends so many of us kept their stones holding them to buy some expensiver rewards after a few Craft Master events. Now i see you mention in your post the philosopher\'s Stone will disappear after the event ends. Will or will they not disappear? ;And if they disappear what with the stones we already had in our inventory? As soon as the event comes, even if you try to find the stones, they won\'t be present in your inventory...Happened with me too. 2019-4-21 02:56 GMT+8 , Processed in 0.079099 second(s), 52 queries .